As I’ve mentioned in other posts, I tend to use keyboard shortcuts a lot in Lightroom. If I want to crop an image I will press ‘r‘, and later either press ‘r‘ again to go to the plain Develop module, or ‘e‘ to hop back to the Library’s Loupe mode. Using the shortcuts helps streamline my work massively. hover over the particular button and hope a “tool tip” will appear. In the following example the cursor (not shown here) is actually hovering over the Loupe icon (just to the right of the Grid). Left- and right-arrows to move to the previous/next image. x to mark an image as a reject. p and u to mark/unmark images as a “pick”. z to zoom in (and out) of an image. 0-5 to assign a rating to an image. Cmd-Z to undo a mistake. b to add/remove an image to the current Target collection (defaults to the Quick Collection). At the same time I’ll sometimes be using a mouse or trackpad to pan around each image looking at the detail. Consider the case where I’m trawling through a set of images to check the fine detail. I’ve pre-rendered 1:1 previews for all the images I’ll be examining at 1:1 (or 2:1 or even 4:1 on “Retina” displays), and I have a fast machine. It has multiple CPUs, lots of RAM, and the Lightroom catalog and previews are on a fast SSD. 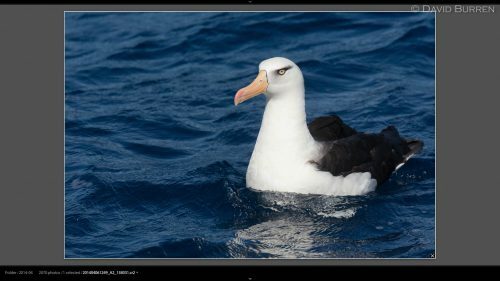 I have a second monitor to the left of my main screen, with Lightroom usually displaying Survey or Loupe mode on it (Loupe mode is faster, but sometimes Survey mode is useful to show multiple images). If you have a second monitor then shift-e selects Loupe mode (without the shift, e would put your main display in Loupe) and shift-n selects Survey mode. I have the main screen set up in Loupe mode with the Navigator panel visible. If I’m not going to be manipulating metadata such as keywords, locations, captions, etc I will have the right-hand panel hidden. I’ll also have the top panel hidden and the “filmstrip” at the bottom minimised in order to see as much of the zoomed-in images as possible at once. You can click on these screenshots for enlarged versions. It would be convenient if I could have the Navigator on the right side of the screen with the Metadata panel instead of on the left (I don’t need to see the Folders/Collections/etc at this point) but as at Lightroom 5 this isn’t an option. Using the above set of shortcuts I can quickly mark images as rejects, assign ratings to some/all of them, manipulate the navigator window with the mouse (with moving subjects the interesting detail will be at different places in the frame), go back/forwards through the images, etc. But I kept getting held up with interruptions to the flow. For example I can press x/z/1/2/3/4/5 with my left hand, and have my right hand on the mouse or trackpad panning around the current image. But when I need to press the left or right arrow keys they’re over on the right side of the keyboard. I have to move either hand away from their default position and then back again. Everything else on the machine happens almost instantly, and this interruption to the flow is surprisingly annoying. So I started looking for options. Incidentally, having the second monitor used by Lightroom does sometimes add a noticeable delay in Survey mode, but I’m finding the combination of whole and zoomed images to be very useful. I looked into other ways of making the functions I was using accessible to one hand via keyboards. First I grabbed a Bluetooth wireless keyboard and put it next to my usual keyboard, but the only way I could get the arrow keys near the z/x/b keys was to place it upside down in front. A little awkward to use (e.g. “right” becomes “left”), and it takes up a lot of desk space. OS X’s keyboard preferences lets you remap keys (globally or for individual programs like Lightroom) so you could remap some keystrokes (such as Ctrl-S and Ctrl-D) to become arrow keys, but I didn’t want to change the functions of any keys. Because I’d become used to it I’d have to change it on both my computers, and I’d have confusing habits to break when using clients’ computers. 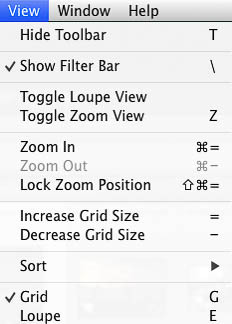 The Keyboard Tamer plugin lets you reassign shortcuts within Lightroom (including assigning shortcuts for some functions that don’t have one by default). For the same reason as not reassigning keys in System Preferences, I’ve chosen not to use this so far. I might use it in the future to add new keyboard shortcuts. The controllers used on Playstation and X-Box game consoles have lots of buttons (and simple joysticks) and some people have put together fancy interface software to let them control Lightroom. Some of this has been Windows-specific, and in all cases has needed relatively fragile software. I decided to look for solutions that didn’t need a lot of continual hacking and tweaking. This is one solution (yes I’ve tested it with Lightroom), but at the moment I’m enjoying using a multi-touch trackpad with its variety of gestures, including easy 2-dimensional scrolling. Some people prefer mice, some prefer trackballs. Luckily there are other options that leave you free to use your choice of pointing device. This is where I felt I’d hit gold. A USB keypad to put to the left of my normal keyboard, where I can use configuration software to program what each key will do. Lightroom can continue to use its default keyboard shortcuts, making transitions to normal keyboards easy. An initial web search found some fairly fancy models in the US, but then I realised that PC gamers have run into this problem before. So I found a cheaper model with lots of features: the Razer Tartarus keypad. It’s advertised as a 25-key keypad, but this is split into three rows of five keys to be operated by the fingers on your left hand, along with two keys and an 8-way controller to be operated by your thumb. The palm rest can be extended slightly to suit bigger hands (obviously they’ve thought about the ergonomics a bit). 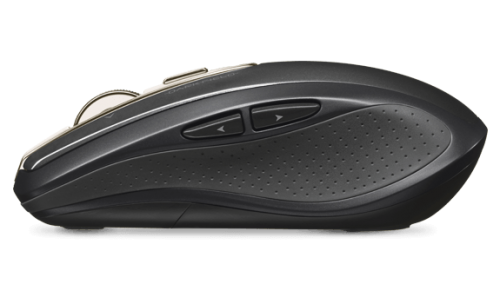 Note that if you’re a left-handed mouse user this isn’t going to work for you, but as I use a mouse or trackpad with my right hand, it suits me fine. 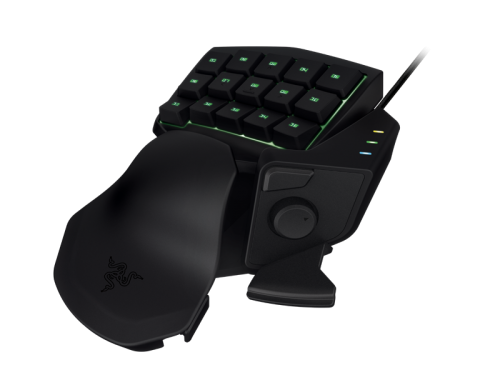 Razer also have the Orbweaver with an extra row of 5 keys (and a different keystroke action, for almost twice the price). There are presumably more options from other gaming manufacturers, but I’ll use this one to illustrate the ideas. If I was in North America I might buy the Tartarus from B&H Photo, but as it’s not photography equipment per se it might be cheaper to shop around PC component suppliers. Here in Australia it’s definitely cheaper that way. The Razer “Synapse” software lets you assign whatever functions you want to all these keys (the default programming is a copy of the left side of a standard QWERTY keyboard). Each function can be mouse clicks, keyboard presses, or lots of other choices (including macros of recorded keystrokes). You could even assign one key to generate the © Copyright symbol if that was awkward to generate otherwise on your operating system. Because everyone’s hands are different sizes, it’s hard to know ahead of time exactly which functions you’ll want assigned to which key. Experiment and tweak! Note that the keys just have a key number on them. Once you sort out a stable set of key programming you could attach adhesive labels, but I would start out with a diagram on a nearby piece of paper which you can annotate as you decide to remap various keys. In my current setup I have the thumbpad giving me left and right arrows (and if I press “up” I get the “Command” modifier: on a Windows machine I would set this to Control). The button below that gives me “space” (a quick way of zooming in/out), and the button above gives me the “Option” modifier (Alt on Windows). The array of 15 keys is set to give me 0/1/2/3/4/5 (for ratings), F8 (shows/hides the right panels on the main screen), x/u/p (for setting flags), b (for adding/removing from the target collection), d/r/e (for selecting develop/crop/loupe modes), and the “Shift” modifier. It’s been about a month since I last tweaked the key layout. I don’t work without a normal keyboard, but this is enough that I can a LOT of work without needing to lift my right hand from the trackpad or my left hand from the Tartarus keypad. Some of these have a set of programmable buttons beside the “drawing”/pointing area, and these will give you still more options. If I used a tablet I would be looking into this and hoping it didn’t require me to move my hand far from the navigation area (where I’m panning around the image). Either that or support enough functions/buttons that I could position my hand over them without needing to reach back to the keyboard too often. I’m very happy with my Tartarus setup! 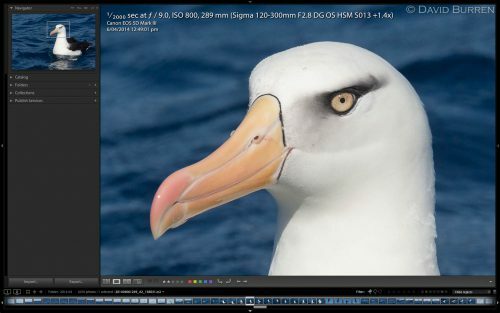 There are probably yet more options out there (for example some “gaming” keyboards have lots of extra programmable keys) but hopefully this may help you think a little “outside the box” in looking for ways to streamline your Lightroom workflow.